But how? 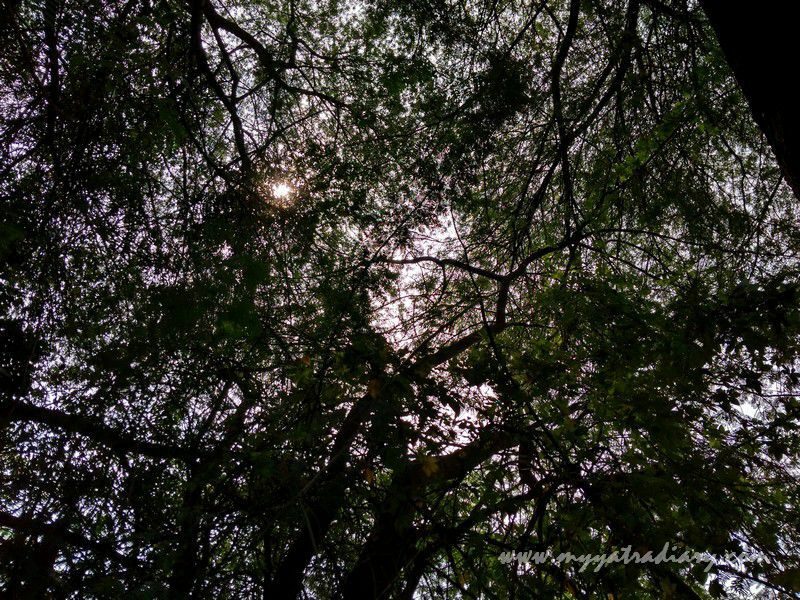 is my instinctive question even as I fix my gaze on the rolling Sahyadri Hills fleeting past my car window. 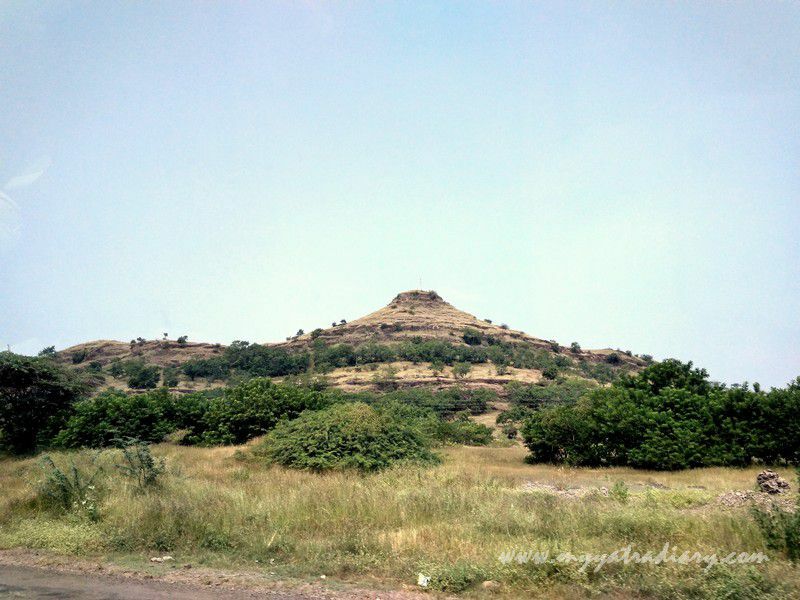 Sahyadri mountain range on the way to Shani Shingnapur from Shirdi. After having left the town of Shirdi after breakfast at around 7.30, we are somewhere on the way to Shani Shingnapur village - home to nearly 5000 people, and a constant influx of devouts that throng the year round. The village, although primarily known for the temple of Lord Shani (one of the nine heavenly objects known as Navagraha in Hindu astrology / Planet Saturn), the tough taskmaster and in mythology represented as the son of the sun, is also hugely popular for having no doors or locks. Curiously, I try to ascertain this claim by taking a closer look at the houses that have now come in my view: First, second and then the third, they all are guarded by doors or curtains. We are still in the outskirts, Madam; some of the houses here have started adding doors to ensure safety for their family but most of the houses in the core of the town still have empty door frames; my driver, Prakash Bhau, is quick to dispel my skepticism. Folklores abound, in media as well as among the local circles; the one who robs has not been able to flee or escape the wrath of this influential deity and the locals narrate every such anecdote with great relish. Such is the power of Shanidev, asserts my driver, if a person steals or does anything insincere in this or past life, he invites for himself a Sade Saati (a period of seven-and-a-half years of bad luck where bad things start happening in the family like court disputes, health issues, accidents, deaths, losses, etc.). Such is the conviction and belief in the deity, he adds. What gives these anecdotes and lores a profound meaning for me is the recurring theme of karma and how the universal laws of justice state that what we sow is what we shall reap akin to investing our dedication, intentions and efforts in a zero balance account and reaping them in a savings account later. As if reading my thoughts, Prakash Bhau chips in again, in an emotion that is partly soaked in reverence and partly in apprehension: Bahut tough hai, (He is very tough), Lord Shanidev makes sure the person with evil intentions pays for his wrongdoings. With this, he leaves one hand from the steering just for a second to catch hold of one of his ear as if asking for repentance and turns on the stereo of the car. For the rest of the journey, Om Nilanjana samabhasam raviputram yamagrajam (the Shanidev mantra pleasing to the God) fills the car mixed with my feelings on the village, the words of my driver and the Lord Himself. Why does the mention of Lord Shani Dev (often) invoke fear in the heart of devouts? inability to face, acknowledge and accept the black demons that reside within us? our own truths of what is right and what is wrong? As the car trundles down the highway from Shirdi towards Shani Shingnapur, questions like these, half-baked, swirl in my mind like leaves tossing in the warm summer breeze outside. The sides of the road are lined with old banyan, neem and other mature trees stretching onto the road to provide shade to the passing rider. Beyond the foliage are rows of thatched huts and beyond these are towering mountains of the western Ghats that meet the distant horizon. 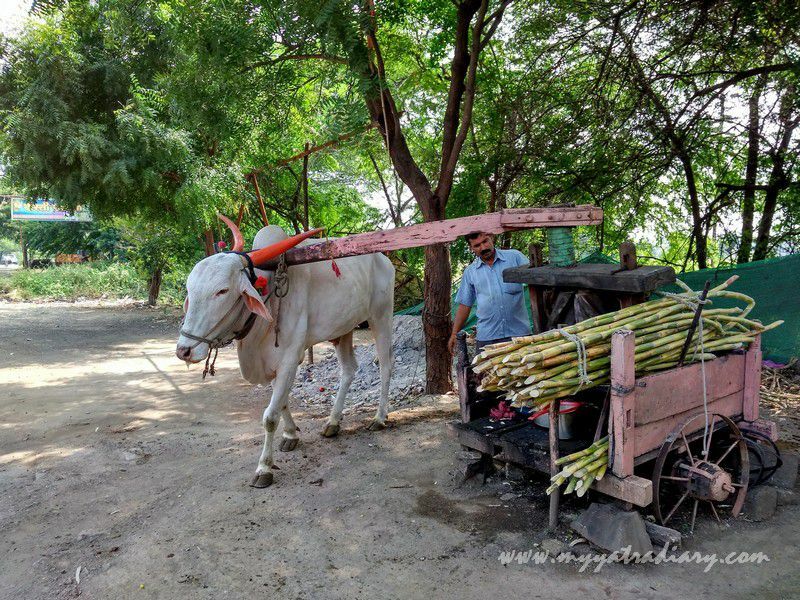 Closer home, the car crosses several rasavanthy’s or sugarcane shacks where pair of bull is traditionally employed to naturally extract sugarcane juice and rejuvenate the thirsty pilgrims. To see the bull patiently and cheerfully go round and round, circling the perimeter of the wooden mill and bringing it in motion is a wonderful delight, so unlike the regular machine juice that we get in most of the cities elsewhere. Yellow Green Juice – cool, sweet and very refreshing – stop at a Rasavanthy for your dose of energy! The entire stretch of road that leads to the town of Shani Shingnapur looks frozen in a filter of retro and it isn’t hard to visualize the peculiar ubiquitous narrative that bounds this remote village, located 50 km off Ahmednagar district in Maharashtra, in a unique, almost mysterious, power packed and intriguing hall of mythical fame. 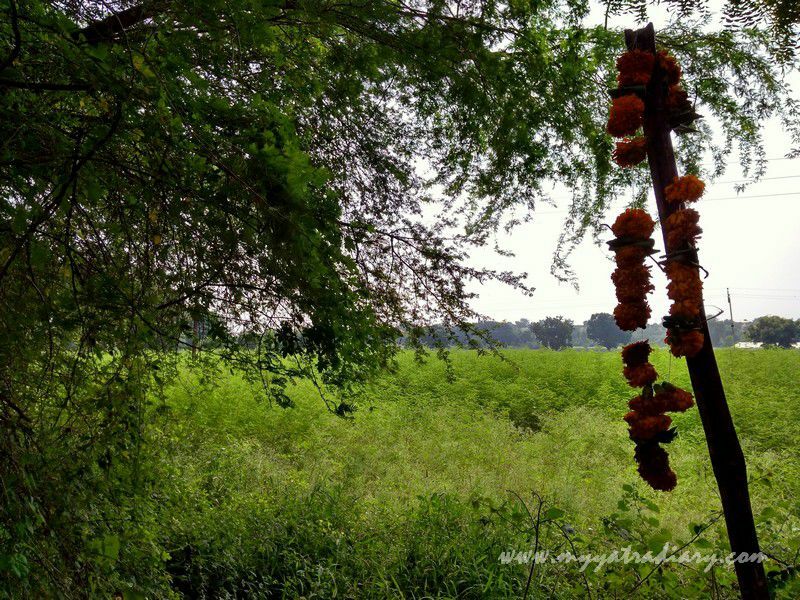 A carpet of green along the highway to Shani Shingnapur. 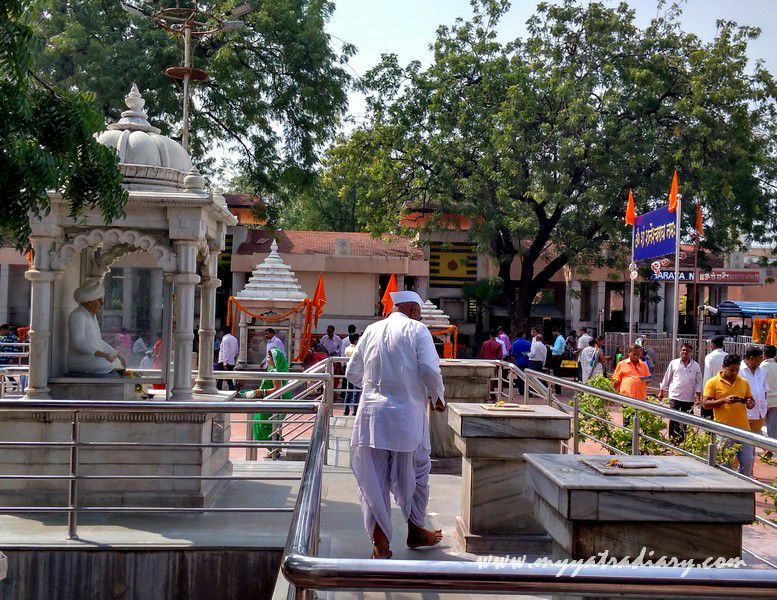 Shortly after, we reach the huge open grounds of Shani Shingnapur, where the pilgrim tourism industry has burgeoned along the length of a 500-metre street that leads to the temple; marked by hotels, restaurants, shops selling all kinds of puja paraphernalia, nazarbattus and parking spots. Nazarbattus to ward off evil sold in the markets of Shani Shingnapur. According to the new rules, bathing is no longer mandatory for men as was the case a few years earlier. So, men don’t need to wear the orange lungi to enter the main temple. In another rule, women can now walk right onto the main platform where the Lord resides in the form of a slab. Shri Shaneshwar Devsthan, temple as seen from the road. A short walk from the parking area, we reach the main temple entrance. To my sheer delight and amazement, the crowds are thin even on a Saturday and in spite of the presence of security to check your baggage; I walk past the sides of the gate without being scanned. 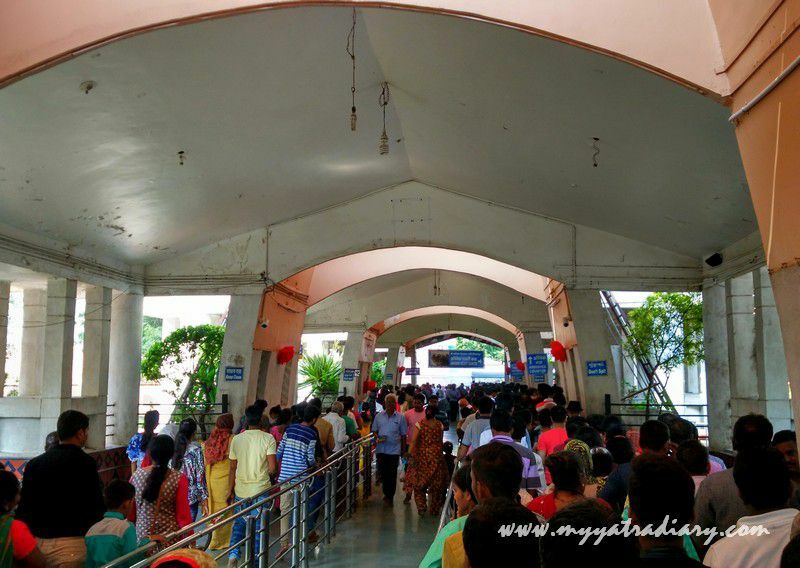 Lines as seen on 21 October 2017, a saturday, on Bhaidooj, two days after Laxmi Puja Badi Diwali. A catacomb of railings welcome me in, in which men and women, young and old, walk together, wait together, to seek the blessings of the Lord. 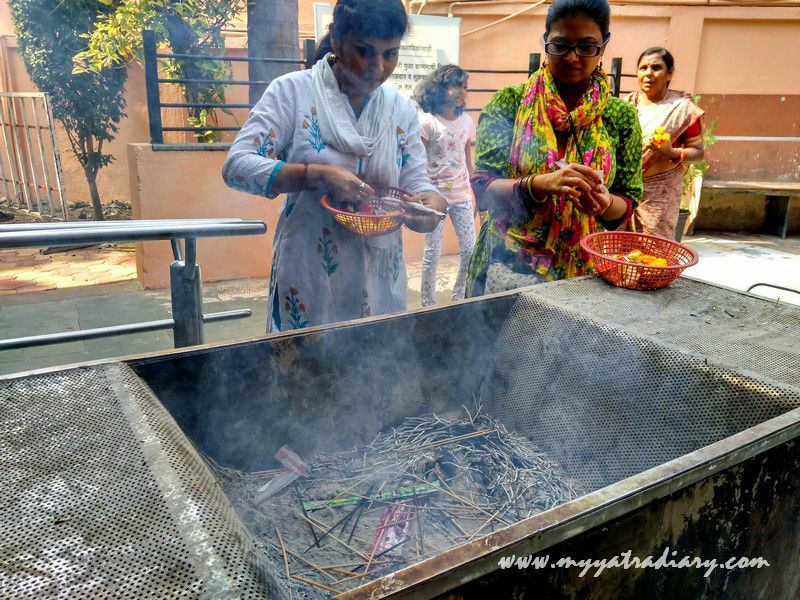 While walking through the queues, you come across a wire mesh where pilgrims can offer rock salt, black til seeds and incense stick for the Lord. The wire mesh continues in an oil receptor tank running alongside where pilgrims pour the oil which is then pumped up and carried through a network of pipes, which, at the end, drips through a copper vessel on top of the Lord. Wire mesh where pilgrims offer til seeds and light incense sticks. 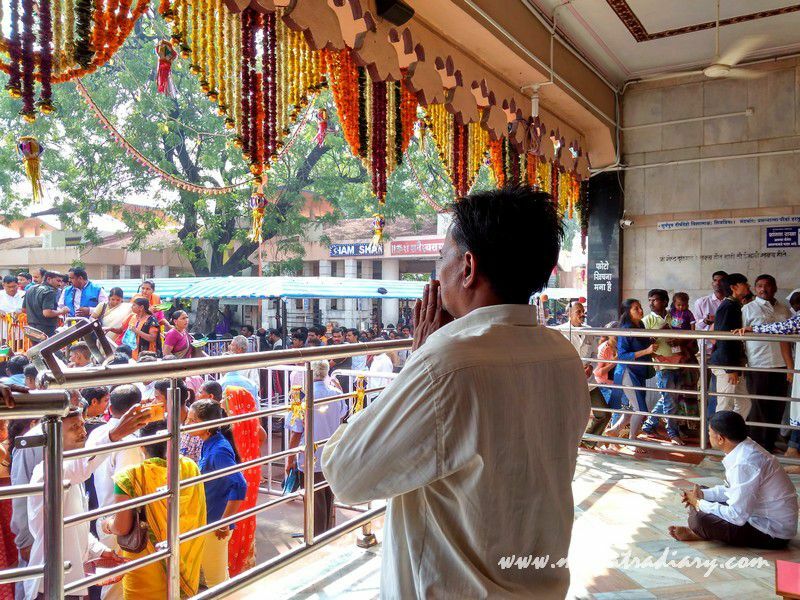 Pretty impressed by this novel and orderly form of 'Tailabhishekam' which eliminates any and all kinds of fuss, I keep walking, and after about an hour, find myself climbing a fleet of stairs that takes me to the main deity in the center. 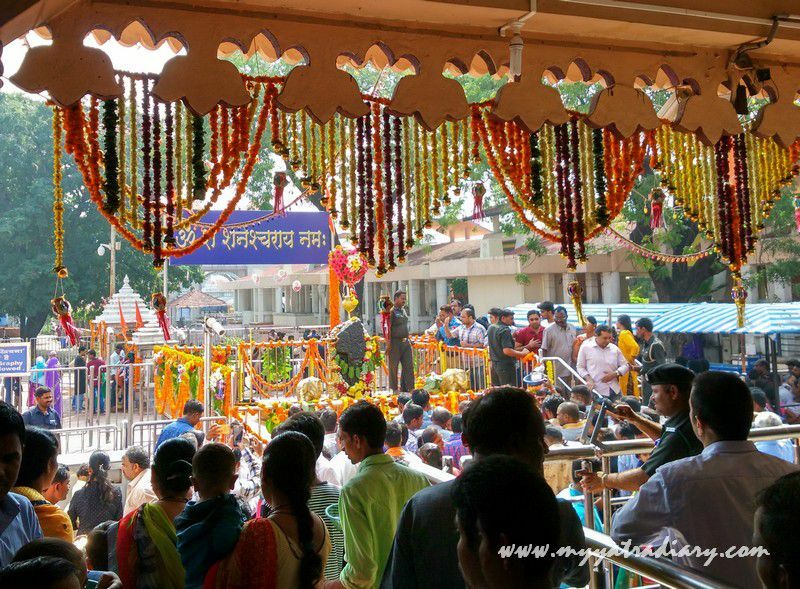 At first glance, it’s a burst of colors; a blossom of flowers and garlands wrapped on the platform and the railing surrounding the deity, as also atop the copper oil vessels that flank the ends of the platform. A few more steps and there He is – in the form of a rock slab over five feet tall with a circular depression on a side seated in the open air sans any roof - Lord Shanidev bathing in a continuous downpour of oil and garlanded in paan leaves and flowers. As goes the narrative, nearly 300 years ago, a slab, after a bout of heavy flooding, had come floating on the shores of the river Panasnala that once flowed through the village. Curious about this new visitor, 1.5 m in height, that captivated their attention; the villagers poked it with a stick only to find it created a deep depression. What’s more, out from the depression, oozed blood! The same night, Shani Dev appeared in the dream of one of the locals, identifying Himself as the slab and asked that He be installed in the village. He also asked that no shrine or sheltered roof be built over him as he’d like to breathe under the open sky. The villagers not only did as suggested but also decided to make do with the locks and doors of their village - such was the faith and conviction in their live deity! 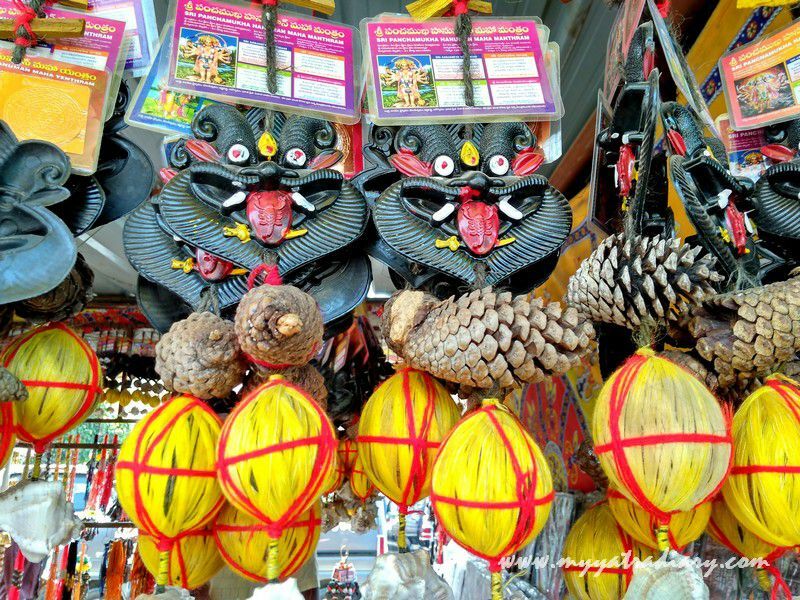 The practice went on unhindered till the 90s, giving the village a peculiar characteristic and a lot of attention and fame. Apparently the first bank that opened in the town in 2011 honored the traditional no-lock-no-door practice by opting for a sliding door instead. Lord Shanidev, surrounded by devotees and seated under the open sky. Today, however, the times are changing; the thefts being reported in the town are increasing, leading to more and more houses opting for alternatives to the latched houses, putting a blatant question mark of safety and security in the face of faith and belief. Whatever be the changing dynamics of this ancient historic town, what has remained constant though is the handsome dark stone slab sitting right in front of me under the canopy of the open sky above, being bathed continuously in a stream of oil. I climb another raised platform, this one sheltered and directly opposite the main, overlooking the open shrine of Lord Shanidev and it is here, that I finally get to see Him to my heart’s desire, albeit from a distance. He looks beautiful. The mantra ‘Neelanjam Sambhasham’ fills the air. aur jeevan jeene ki kala sikhata rehta hai. I look at the Lord for one last time before filing out.... through the lens of my eyes, the slab looks a tad blurry but the God - the God feels absolutely human and the blessings so true... I walk out, a little disoriented, but feeling a lot more closer to the Lord, and to my own self. 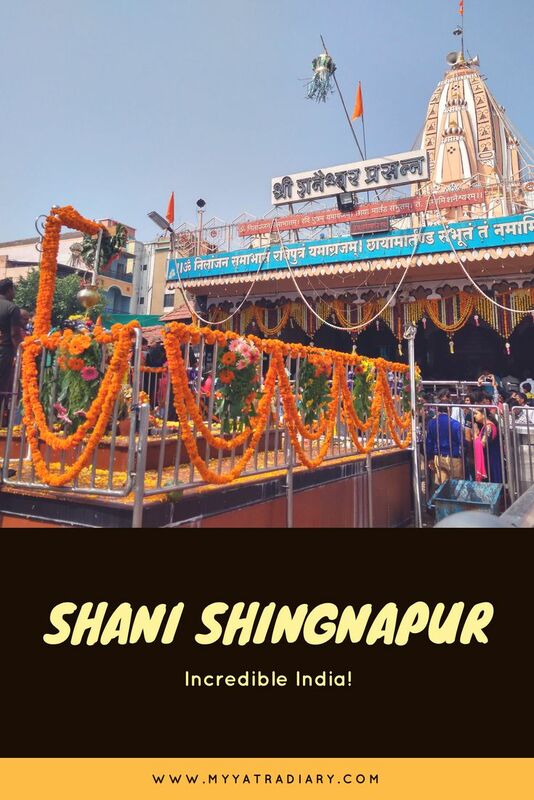 Shani Shingnapur in Ahmednagar District is well connected and easily accessible by road and rail. 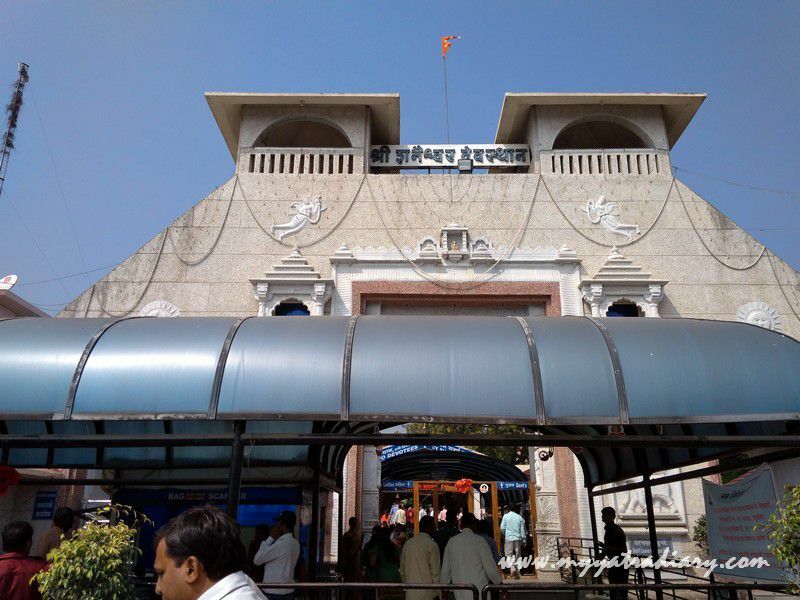 Rail: The nearest railway stations to Shani Shingnapur are Rahuri , Ahmednagar , Vambori and Shrirampur from where one can take a cab or board a bus to travel the remaining kilometers to reach Shingnapur town. Road: There are many buses operated by Maharashtra State Road Transport Corporation (MSRTC) along with private buses and cars which can be booked in advance and used to reach the place. Air: The nearest airport to Shani Shingnapur is Aurangabad airport located at a distance of 90 km. Airport at Nasik is situated at 144 km while Pune is over 160 km away. 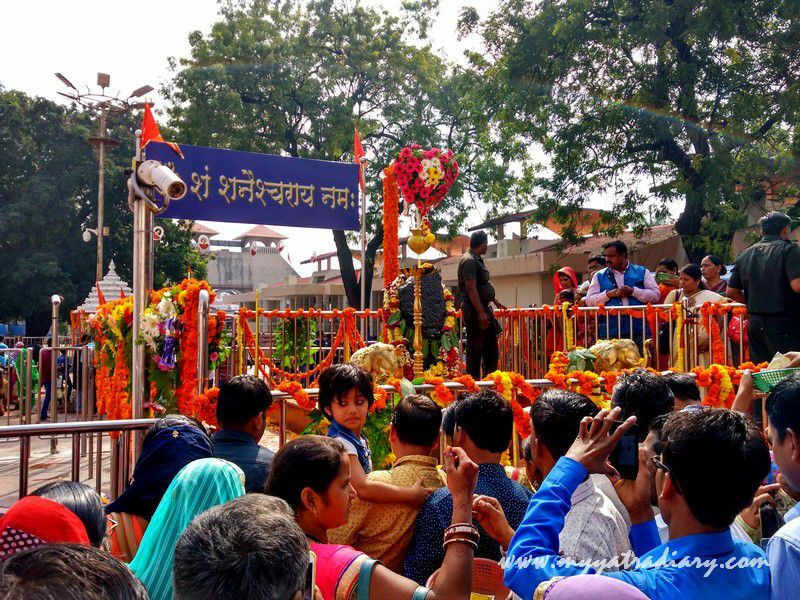 Where to stay in Shani Shingnapur? Few options are available as accommodations for pilgrims here. My suggestion would be to stay in Shirdi as a base and then travel here as a day trip. 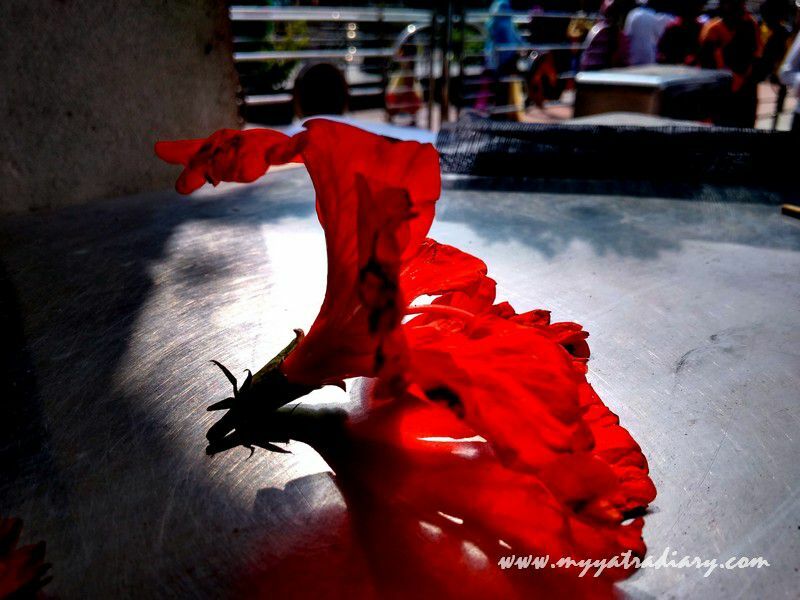 We stayed in MTDC's Pilgrim's Inn and left for Shani Shingnapur early morning. We were back in our car around afternoon time. Stay at Shirdi overnight since staying options at Shani Shingnapur are few and ideally start for Shani Shingnapur early in the morning after breakfast. It takes around 4-6 hours depending on the rush so plan accordingly. Do stop at one of the rasavanthy's along the way. The bulls not only pull the wooden mill but will also tug a few strings at your heart. The sugarcane juice is just amazing as well! Other temples: Don't miss the Dattatrey temple located in the premises of the temple. Temple Timings: Temple is open 24*7 for the devotees, all days of the week, all round the year. Festivals: Amavasya (the new moon day) is the most auspicious day to visit this temple. If it's Shani Amavashya, the auspiciousness is considered even more since it is the birthday of the Lord and is celebrated with great enthusiasm and fervour. Another day when crowds gather in huge numbers is Gudi Padava, the first day of the new yer according to the Hindu calendar! Nice account of your visit to Shani Shinganapur. Is there anything to explore other than the temple in this town? In proper Shani Shingnapur - not much, except the doors and the temple! The mix of all colors swirled together is black. I always look closely at your photos showing both culture and reverence. I visit your world with an open heart, Arti.